I am finalizing the port of PlayDetective: Heartbreakers to Mac OS X (Macintosh). I expect it to be ready within two weeks. 1 - I have been (and I am still) very busy at my daytime job. 2 - At the request of some potential publishers, I have been making some modifications to the gameplay, and it requires a lot of work since each publisher want me to modify the gameplay in a different way. 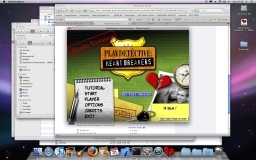 3 - I have been busy, localizing PlayDetective to Russian. I have got a retail + online publishing deal with a company called Noviy Disk. If things go well, the game will be released on the Russian and CIS markets in March. Kayo Games today announced the launch of PlayDetective: Heartbreakers, their new detective adventure game, which is now available for PC download. 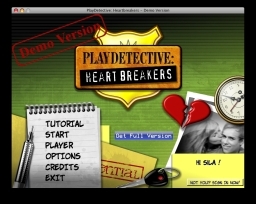 PlayDetective: Heartbreakers puts you in the gumshoes of a private investigator as he investigates a series of infidelity cases. Conduct surveillance using a range of tools and gadgets, collect and analyze evidence, and solve mind-bending puzzles. Anything to make sure you get your man… or woman. A wayward husband who can’t seem to stay out of the clubs in the seedier parts of town? A girlfriend who seems to be getting a little too close to her boss at work? Or just a concerned wife who needs a little reassurance that her partner only has eyes for her? It’s all in a day’s work for this detective. Whether you take a direct approach and interview your suspects and gauge their responses on your lie detector, or just while away the hours playing some classic games at your local casino while your phone taps do your work for you, it’s down to you. • Investigate 15 unique cases, each packed with more locations, games and intrigue than the last. • Eavesdrop using phone tapping devices or use your trusty camera and zoom lens to catch your suspects in the act. • Recover deleted text messages and piece them together to form evidence for or against your suspect. • Conduct polygraph (lie detector) tests during interviews to unearth the truth. • Play a selection of classic sub-games to earn cash which will aid you in your investigations. • Buy and sell investigation gadgets – the tools of your trade. • Confront suspects during the tense moment when you catch them in the act with their lovers. For more information and to try PlayDetective: Heartbreakers for yourself visit http://www.playdetective.com . NOTE TO EDITORS, JOURNALISTS AND BLOGGERS: A free registration key for a review is available upon request. Contact us for more information or to request a registration key. I am planning to release the PC version of my game PlayDetective:Heartbreakers in March 2007 (this month). The exact date has not been fixed yet. I am first planning to release a demo version, get feedback from players, make some minor modifications based on the feedback and then release the full version. I have also (re)setup a forum to discuss the game. The forum is currently ‘open’, meaning that you don’t need to register before posting. Please feel free to post any comment or question you might have. Based on the feedback I got after releasing a demo of PlayDetective last October, I decided to look for an artist that will help me improve the game (http://forums.indiegamer.com/showthread.php?t=8837). I have already found one (talented) artist for the UI, but I am still undecided on how to proceed with the avatars. A cheap solution will consist of buying stock images from http://ptgu.com and use a tool like GIMP to retouch them. I am also implementing a “Lie detector” mini-game for PlayDetective. I will post new screenshots and videos pretty as soon. I have finally managed to complete the demo version of the game. The official site is www.playdetective.com there you can find the latest screenshots and a video of the game. The demo version can also be downloaded from there. Please try the game and post your comments here.